1. Don't buy a pre-filled spice carousel/rack. You might not even use all of the spices on it, it will take up a bunch of room on your countertop, and you don't know how long those spices have been sitting in that box (ick!). 2. Utilize all of the space you have. I use these magnetic spice tins that stack on top of each other so I can fit all of my spices into my tiny cabinet. I like having most of my spices in uniform containers, and I also like that they're easy to refill. 3. 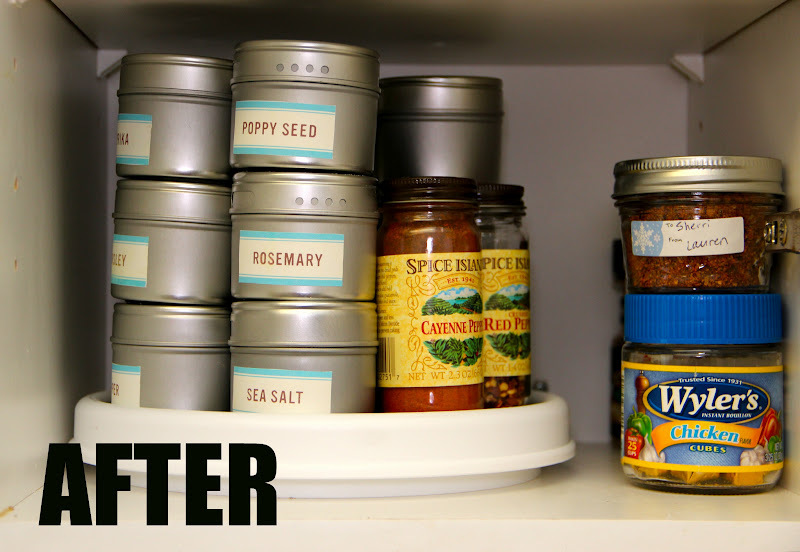 Make sure you're able to see each of your spice jars or containers. Jillian inspired me to get this non-skid turntable, and now I can actually see what's in my cabinet! I got the size that fits in my cabinet and is still able to spin, but also leaves a little room on the side for other things. 4. Clearly label your spices. I printed these labels onto adhesive paper and stuck them on my tins. With a quick glance I can see what I need to grab. I also organized my spices alphabetically so I would know exactly where each one was. It might be more helpful for you to organize them by which spices you use most frequently. 5. Remove doubles and store them somewhere else. I had back-ups of several different spices that were just cluttering my cabinet. I made sure all of my tins were filled and then stuck my extras in the pantry where they're not in the way. 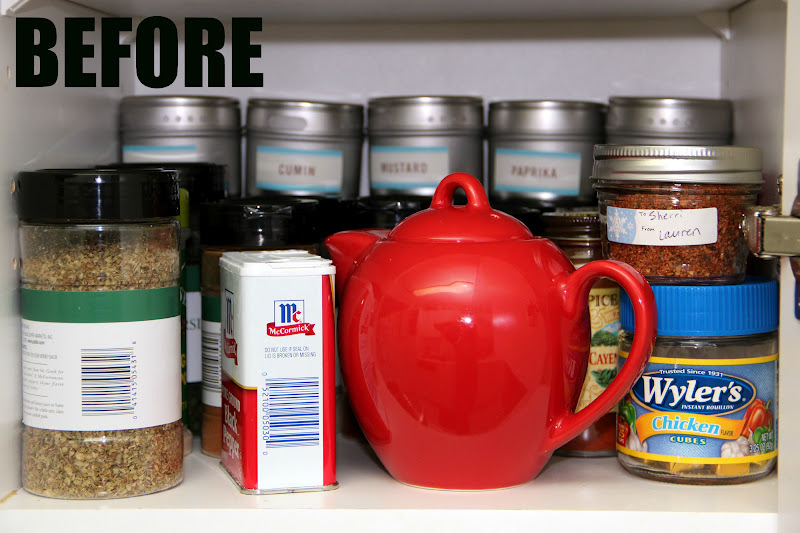 I hope these ideas help get you started on a more organized spice cabinet! i very much like the idea of labelled magentic tins. nice. I've got to do this....I'm not even sure what spices I have in the back of the cabinet! Gross! Yay, so glad you did this! Isn't the turntable like the best thing ever? It freed up a surprising amount of space in the cabinet. I love your tip about not buying the spices that usually come with the rack. Not only do you not know how long they've been there, but you could be paying for subpar quality or spices you don't even use. I love carousels for spices! I have a two-tiered one (got the idea from my mom) and it works wonders! I can fit so much in my cabinet but have easy access to it all! One thing I have been thinking about investing in lately is uniform containers. I need to figure out which ones I like best. Glad you found a solution for your spice cabinet! It looks so much better. This looks great! I'm so embarrassed about the state of my spice cabinet. Totally need those magnetic jars! I totally have one of those pre-filled spice racks (actually we got it for a wedding present about 6 yrs ago now)...and I only ever use about 1/3 of the spices! I was just thinking the other day about how it takes up way too much space on my counter, thanks for all the helpful organizing tips! I have a spice "drawer" and I could really use some of those little tins, but everything I've found has been so expensive. It's kind of sad how unorganized it is. Your first tip on the list is SO TRUE. I got one of those when I got married, coming up on 5 years, I threw out most of those spices because you may use them once in a blue moon. There are definitely a certain list of "staple" spices that you need to keep around and that's about it! Just organized my spice drawer! Great minds think a like! I just need to get some uniform containers to "prettify" things. Great job! Looks good! I need to re-do mine. Maybe this summer I can tackle that project with some new spice tins and cute labels. Want to come help?? This is a great idea! My husband is always telling me we need to organize our spices! When I have my own place again I want my spice rack nice and organized! Love how you organized yours! Awesome! We have like stadium level seating for our spice cabinet, if that makes any sense. It's probably not as efficient as your cabinet, but it works :) Happy Thursday, Sherri! You are awesome and have inspired me to organize my spices.